Barrie went and hugged Pru, but she had no idea what to say. How could she explain that her heart ached at the loss of Pru's dreams, at the stolen pieces of Pru's life? How could she tell Pru she understood the kind of fear that seized every muscle and made the world so big that it was easier not to leave your small corner of it. Fear could become an ocean that swallowed you whole. "I'm not sure how I would have answered that this morning, but someone with a lot of insight reminded me that it's the not knowing that makes it impossible to move on from where you are." At Waston's Landing she felt connected to Eight and to the earth and sky and trees, to Pru and the yunwi. To the Fire Carrier and the water the wrapped Watson's Island in a veil of magic. At Waston's Landing she felt found instead of lost. "This is a boy, not a dress!" "Which only make him harder to return!" When I first read the synopsis for Compulsion, I thought it sounded rather interesting. When I got the book in the mail, I began to feel iffy about reading it. Compulsion sounded like a good book, but I worried it would be too cheesey, too cliche, and I would spend most of it rolling my eyes. And dear reader . . . It. Is. Amazing. We start the story with Barrie waiting at the airport for her aunt, whom she has never met and only recently found out existed, to pick her up. Barrie's mother recently died and her godfather, Mark, is on death's door. Aunt Pru is the only family she has left and is moving from California to South Carolina in her senior year of high school. Rough. 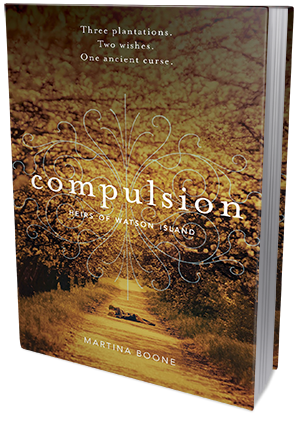 Compulsion is full of mystery and intrigue. Barrie's family has a gift of finding lost things, anything from paper clips to wedding rings and when Barrie shows up at Watson Island she stumbles into a history that she grew up knowing nothing of and soon finds herself up to her elbows in questions. Watson Island belongs to the three founding families: the Wastons of Watson's Landing, the Beauforts of Beaufort Hall, and the Cloesworths of Colesworth Place. There is such an intriguing history behind these three families and while we are introduced to all three, there are so many questions I have about their history and the truth behind them. Martina answers a few of these questions, but I am beyond intrigued and desperate to know more. Let's just say there is enough mystery in Compulsion to satisfy Nancy Drew. I'm beyond thrilled that this novel is not a standalone, which I had thought it was when I started reading it. The ending is great because it ends like a standalone, but teases of things to come. There are unanswered questions, but Martina wraps things up in a non-cliffhanger format. A huge sigh of relief for any lover of series. Compulsion is beautifully written. I could see myself in Watson's Landing, on Eight's Boat Away, standing in front of the ruins of Colesworth Place, and wandering around the picturesque Watson Island. Martina brings this story alive with a thrilling mystery, gripping suspense, descriptive writing, and the perfect amount of a sweet romance. This is not a series you're going to want to pass up.